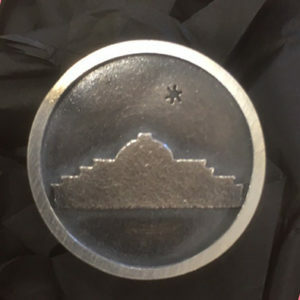 Sterling silver brooches made by Whanganui jeweler, Frances Stachl, and sold in the Sarjeant Gallery shop, feature the historic Gallery, ‘Te Whare o Rehua Whanganui’ with a star pricked in the sky. 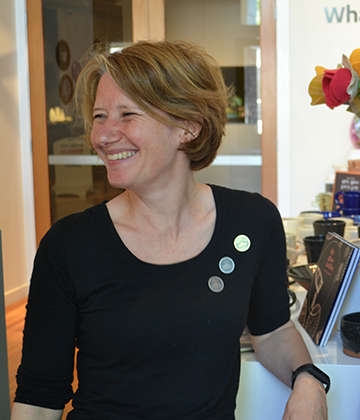 Proceeds from the sale of the brooches go towards the redevelopment fund of the Gallery. The star represents the Sarjeant’s Thousand Stars project, which is part of the fund raising for the earthquake strengthening and redevelopment of the Gallery. A special ‘Star version’ of the brooch has a small 24-karat gold accent on the star. Ms Stachl made the original brooch (25mm in diameter) by hand and had a mold made for ease of reproduction. She hand finished the casts in her workshop, just a block away from the Sarjeant Gallery on the Quay, beside the Whanganui River. She made the original by piercing the shape of the Sarjeant Gallery and star detail with a jeweler’s handsaw. “One of the things that I especially like about the practice of making jewelry is that although there are some advances in technology, you can still work very simply, using essentially the same hand tools as a jeweler might have 500 years earlier,” Ms Stachl said. She has a long association with the Sarjeant Gallery – as a secondary school art student, then later working as a cleaner for a year or so in her early 20’s when she began making jewelry. “[Last year] I had the great honor of exhibiting my first solo show in a public gallery with [the Sarjeant] Fiction in the space between. The support the staff offered me during that period and afterwards has been enormous.” She has also been awarded Merit for the past two years at the Belton, Smith & Associates Ltd Whanganui Arts Review. Ms Stachl said having an institution like the Sarjeant in Whanganui is invaluable. It was there she encountered Warwick Freeman’s ‘Feather, fern, fish and rose’ series of brooches, contemporary works made using precious metals and traditional jewelry techniques. People who buy a brooch will contribute directly to the redevelopment of one of Whanganui’s most iconic assets.